I imagine that nearly all of you reading this have seen news reports over the past month about protests and unrest in Belfast. This post will attempt to give an update about what is happening in our community and share ways that you can pray. It has been difficult to write, as there is a deep complexity to the situation, with many perspectives among the local people. I also realize that while some reading this are well-versed in Northern Irish politics and history, others are not. Feel free to comment or e-mail us with questions or comments. There are also links to a recent article and radio program at the bottom of this post. 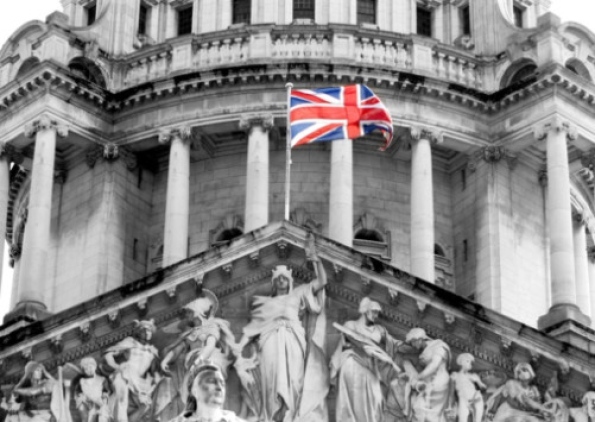 On December 3rd, Belfast City Council decided to change it’s policy on flying the British flag at Belfast City Hall. It is no longer flown every day, but only on a handful of ‘designated days’ throughout the year. The rational was to express sensitivity to the fact that Belfast is a shared space where many do not identify positively with the British flag. The flag will continue to be flown on certain national holidays to recognize that Belfast remains a part of the UK. This decision was upsetting to some within the unionist/loyalist community, who did not want a change or feel it was necessary. Obviously, this is not just about a flag, or about a single decision. 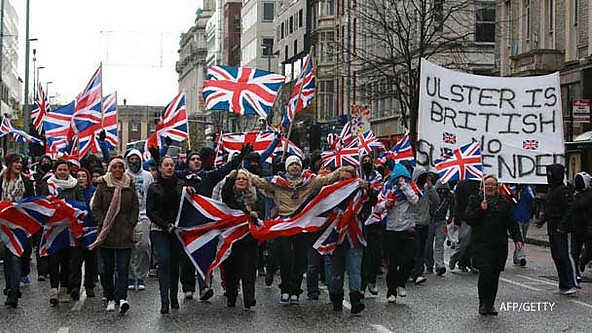 Some unionists have expressed that the past 15 years (since the 1998 peace agreement) have led to an erosion of their British identity. Within more deprived loyalist communities, like the area around East Belfast Mission, many express a lack of hope in the political process. People are not happy with politicians, and say their views are not represented. The decision about the flag has become a touchstone issue which is symbolic of larger frustrations within loyalism. There have been over 40 days of protests against this flag decision. While some have been smaller, the largest of these was last Friday evening when many coordinated protests involved approximately 4,000 people around Northern Ireland. Several main roads in Belfast were blocked from 6-8pm. Some of these gatherings have turned violent, resulting in clashes between loyalist protesters and police. Only a fraction of those who are protesting have engaged in violence – and this group contains many teenagers and children as young as 10. This is a saddening thing to witness. 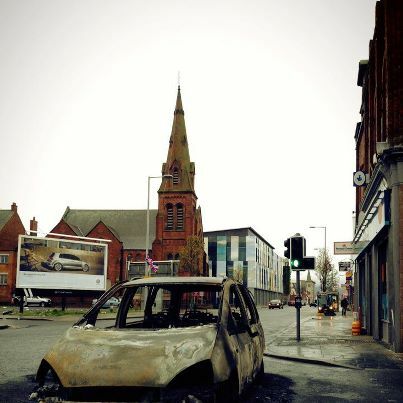 The violence does not affect Northern Ireland equally, but has been largely concentrated in a section of East Belfast close to the Mission. EBM is about a quarter mile from an ‘interface’ with a nationalist community called the Short Strand. During the month, there have been increasing tensions between loyalist protestors and residents in this neighborhood, as groups have marched from East Belfast into the city and back. This situation has grown more fragile, and there were direct confrontations between these communities on Saturday and again Monday night. From seeing news coverage, you might imagine that most of Northern Ireland is in turmoil, which would not be the case. If you drive a mile or two away from the Mission, the atmosphere feels completely different. As with many situations of violence, it is the struggling communities which often bear the majority of the impact. Many people across the city and province have been going about their daily lives. Some may question the decision of the City Council, yet have a deepening frustration at the ongoing turmoil, conflict, and bad publicity being sent across the world. One widely held observation is that the disturbances are affecting business and future investment in a broad way (I have a friend planning a golfing trip here who is thinking of cancelling). – pray for meaningful dialog between local politicians, community leaders, the police, and those involved in protests. Pray for key leaders at EBM who are involved in these conversations, especially Gary Mason and Mark Houston. – pray for protection for residents who live along the interface between the loyalist area of East Belfast and the Short Strand community and feel varying degrees of oppression, uncertainty and fear. We have been visiting and checking with those connected to the congregation and wider mission who live in the areas immediately affected. – pray for the young people who are caught up in the fascination and excitement of the disturbances. In some cases, this involves children as young as 10. In many ways, they do not understand the complexity of the issues or the consequences of their actions, but are captive to the circumstances and emotions of these moments. Of course, by being involved in rioting, both their lives and their future is in danger. At the outset of Jesus’ ministry, after he is baptized by John and then endures 40 days of temptation, he comes to Nazareth and reads these words from Isaiah 61. I am conscious of the conditions of oppression, captivity, and poverty in our community. When we seek to act as disciples of Jesus, our ministry looks to address these conditions in the world, wherever we find ourselves. Of course, this is not just for Belfast, where the needs of our community have become suddenly obvious in a fresh way. I also remember the struggles of people facing homelessness in Orlando, the families in Sandy Hook continuing to grieve over the tragic loss of their children, and many who suffer from a lack of hope in their lives – for so many reasons. Some situations are dramatic and well-documented, while others hurt quietly. Right now, the people at EBM are asking themselves – God, how can you use us this day to contribute to the healing of our city and our neighborhood? The answer is not always obvious, especially in a situation of crisis. Wherever you read this, it is a good question to consider. A BBC radio program from this past Sunday called Sunday Sequence, at which Mark Houston (EBM Mission Director) was one contributor. Go 30 minutes into this program to hear the 9am news and then a panel discussion. I’ve been praying for you and will continue to do so. Much love. Britt and Allison, we continue to pray for your family and members of EBM. Our Senior Friends began praying for you last week and will continue to do so. Know you are loved and blessed through the ministry you provide. Nice to meet you over the internet. I have heard that suggestion from two perspectives – but I do not think that any group is planning a mass exodus from N. Ireland. The challenge, in my perception, is for people to learn to live together, despite having different identities, and also carrying pain from the past. Our prayer team at Peace UMC is leading us in “A Season of Healing,” and our brothers and sisters in Northern Ireland are in our prayers. Thanks for guiding our prayers, Britt. Praying for you guys-thanks for helping us all gain better understanding of what is happening and providing us with a link that will help others connect with EBM and join in prayers for healing. wisdom and grace. Blessings! Thankyou for sharing this, living so far from home I wasn’t quite sure what was the heart of the issue was so thanks for explaining. Thanks for the post. I am very interested in your work there. Britt and Allison, You and EB Mission are in our thoughts and prayers. What an eye opening post you sent! Thank you. Thought you would like to know that IDignity served its 10,000th client on Thursday.